How Much Is A Jumbo Loan Going to Cost Me? How Much is a Jumbo Loan and What are the Factors? How much is a jumbo loan? Well, that’s a big, complicated question and the answer isn’t just one number. The prices that make up this kind of an investment (and most others) include loan limits, down payments, closing costs, and interest rates. This article gives a pretty wide overview of each of these. The loan limits for conforming loans vary depending on county. Some counties in the U.S. feature larger limits simply because housing tends to be priced much higher in those areas. Jumbo limits start where the conventional limits leave off, but where they end is a little less predictable. The maximum jumbo limit is around 3 to 4 million, but like I said, this varies by how much a lender is willing to offer. This max limit might be closer to 1.5 million, depending on the area and lender. Credit score and whether the loan is VA approved or not affect down payment costs. For regular jumbo loans, many lenders would require a down payment of 25 percent or more on the full price of the home. This isn’t the case anymore. With a good credit score and other qualifications, some borrowers are only required to put down about 20 percent—or even less. Conforming loans have lower credit score requirements than non-conforming loans. You’ll see a lot of different numbers floating around, but you can bet most lenders will ask for credit scores somewhere around the 700 mark. This isn’t the same across the board since different lenders require different credit scores. Plus, other qualifications may allow a borrower to get an approved jumbo loan with a lower credit score in some cases. For VA jumbo loans, the down payments are different from both regular jumbo loans as well as regular VA loans (which typically don’t require a down payment). The veteran pays 25 percent of the difference between the county loan limit and the price of the home, which is admittedly a lot more than your typical VA but much lower than a regular jumbo loans down payment. 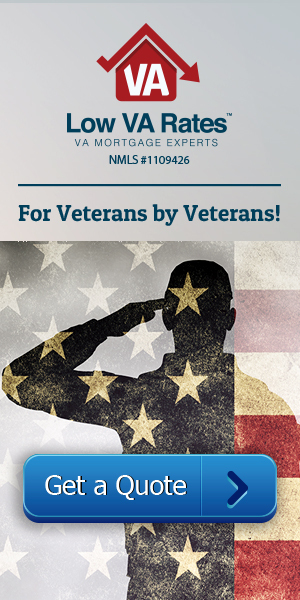 Many veterans ask how much is a jumbo loan and the closing costs? Since the houses requiring jumbo loans cost much more than most, the closing costs are similarly going to be much higher. However, what is calculated into closing costs isn’t much different with jumbo loans. With loans approved by the VA, there are only a few fees the borrower is allowed to pay. These include appraisals, title insurance, survey costs, the credit report, the origination fee, and the recording fee. Rates for the jumbo are available in a variety of either fixed or adjustable mortgages. Recently jumbo loans have had lower APR than conforming loans that are comparable since the market has recovered from the meltdown. This is also a result of stricter lending requirements and higher down payments. In other words, this is a great time to take advantage of these mortgages. However, rates have typically been higher for jumbo loans due to the high risk they pose for lenders. With larger loan amounts, there are far fewer lenders willing to invest. Part of this is because of the difficulties tied to luxury homes: 1) they take more time to sell; 2) their valuation tends to shift more than lower-priced houses. Know too that more money will go toward interest than principal the first few years of the loan, so it is a little more difficult to build up equity. Although jumbo loans have always been a big investment, a few key changes now make them more reasonable and affordable options. If you are on the brink of purchasing a house that is right over the conventional limit, consider the costs of the jumbo loan. To get help determining whether a jumbo loan would be a feasible option for you, contact us. We’d love to answer any questions you have.